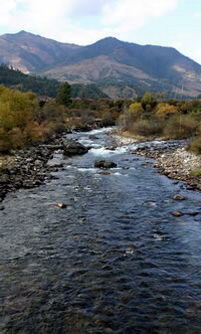 Bhutan is one of the last unexplored fishing destinations in the world. For centuries, with its back turned to the outside world, Bhutan had remained a mystery, Fishing in Bhutan remains largely under-discovered. Due to the lack of a comprehensive survey, the complete list of the species is not very clear. About forty species have been recorded, with new species discovered every year. Fishing spots range from large rivers to crystal clear spring-fed streams. Altitudes range from a low of 1200 m. to 3000m. The most common varieties are the snow trout (belonging to the carp family) and the brown trout (which has thrived since its introduction some decades ago). The best times for fishing are in spring (March to May) and fall (September to November). In Bhutan you will experience the unique joy of fishing, in which beautiful trout streams, mountains and cultural scenes from 8th century mix in harmony. Fishing in the crystal clear rivers set against breathtaking landscape is what every angler dreams for. Our fishing trips offer a creative combination of fishing in the best spots and cultural activities. To organize a trip for only fishing would be a mistake. With its ancient culture, mystical religion, many historic sites, exotic festivals, and rich environment, Bhutan has many attractions to offer. You could also choose to trek and fish in the picturesque lakes that dot the mountains. Or fish during the day and camp along the rivers wherever possible, with sight seeing along the way; with your own off-road car, guide and cook, we can offer you an experience that will be hard to forget. Write to us and we will help you design your own customized trip.